Right off the bat I feel the need for a disclosure: I'm not a movie reviewer. I took a film class in college, but that doesn't count. I also love watching movies, but that doesn't make me a credible reviewer. I do have a lot of respect for professional film critics because it's not an easy job. I recall being on jury duty in NYC about a dozen years ago and the film critic Jeffrey Lyons was in my group of potential jurors. It was right before the Oscars and we had a few hours to kill while we waited (before eventually being dismissed from a trial), so I had the opportunity to ask his opinion about some of the films up for Best Picture of the Year. I was amazed at how knowledgeable he was about each movie. Personally, I have a hard time remembering anything about a movie after I see it, let alone the names of the actors in the movie. Now that I got that disclosure out of the way I feel much better. You see, after publishing a little blurb on my PopJewish.com blog about the Jewtopia movie that opened this past weekend I was asked by the film's public relations guy if I'd be interested in screening the movie and reviewing it. So I said sure. Which was a mistake. Because it was right before Yom Kippur and I was busy with a million things including writing sermons for said holiday and really didn't have time to watch an hour-and-a-half movie. So after Yom Kippur was already a memory and the first couple days of Sukkot had passed I finally got around to screening it. I can probably sum up this movie in one Yiddish word: OY! It was horrible. I sort of feel bad saying that because I don't think this movie will get a single positive review. It was that awful. While I enjoyed seeing Jewtopia off Broadway in NYC several years ago and found the non-stop Jewish satire to be pretty funny, the movie version was just... well... different. 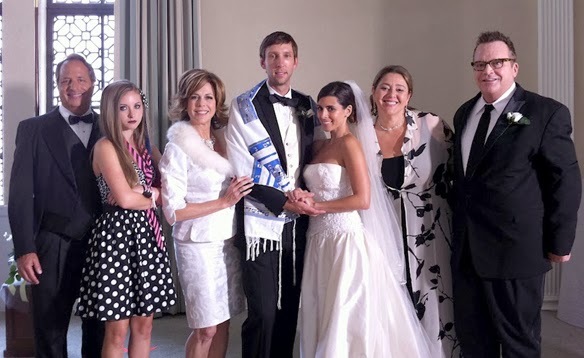 Despite a cast of well-known actors like Jamie Lynn Sigler, Jon Lovitz, Rita Wilson and Jennifer Love Hewitt, the movie is a broken record of Jewish stereotypes. It was insufferable. A cross between the Naked Gun movies and the Hebrew Hammer, this is a raunchy (unnecessarily so) story about a nebbish Jewish guy (Joel David Moore) who doesn't want to marry his Jewish fiance (Jamie Lynn Sigler) and a very non-Jewish guy (Ivan Sergei) who only wants to get married to a Jewish girl even if that means undergoing a circumcision surgery (it's only a procedure when its done on a baby!). The two childhood friends have to help each other in their pursuits of "the Other". Somehow on a stage Bryan Fogel and Sam Wolfson managed to deliver this pseudo-offensive stereotype laden humor in a fun, feel-good sort of way. The movie version fails. And fails badly. The caricature of the rabbi would be funny enough without resorting to toilet humor. Jews are picky when it comes to ordering in restaurants -- okay, we chuckled at that joke the first time around but by the dozenth it was more than enough. The bridge tournament, vaginal rejuvenation surgery and multiple hunting trips with the gentiles was just filler in a movie that had me looking at my watch more than once to see when the painful experience would end. The bottom line is that Fogel and Wolfson should have counted their lucky stars that their Jewtopia stage version and book by the same name were so successful. And then they should have stopped right there. This was just a mess. Oy!